Fourth Generation Pharmacists – 1899 to the present. Williams Bros. Health Care Pharmacy was established in 1988 by brothers Charles, Mark, and Jeff Williams. 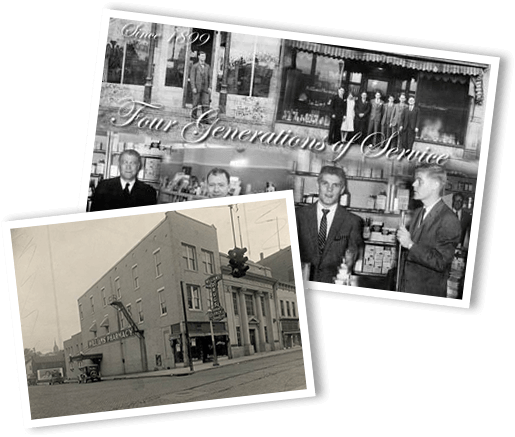 The brothers wanted to revive and expand upon the original pharmacy business begun by their great-grandfather, Charles C. Williams, in 1899 and continued through grandfather, Joe, and father, Paul. The brothers initially began a retail pharmacy and home medical equipment company in 1988. In 1990 they expanded to provide home infusion, and then in 1995, a long term care pharmacy division was added to complete the health care services company. More than 400 employees share their mission and vision to help achieve their goals. Williams Bros. is committed to exceeding customer expectations by continually expanding services, technology and product offerings to be the company of choice for your health care service needs throughout Indiana, Illinois, Kentucky and Ohio. Williams Bros. provides outstanding customer service to make you a customer for life. Customized programs » On-demand, cycle fill, unit dose, or multi-dose compliance packaging. Williams Bros. will customize a medication delivery program that meets the needs of your facility. Personalized Service » As a valued Williams Bros. customer you'll have your own billing technician and medical records manager, to answer billing questions, customize your medical records and find solutions to help you and your staff serve your residents better. Technology Solutions » Williams Bros. provides tools to help you efficiently manage your pharmacy needs. Electronic Medical Records, online access to medication management tools and reports, medication refills/status, and pharmacist consultant reports make it easier for your staff to manage their residents. Consultant Pharmacists » Williams Bros.’ Consultant Pharmacists document monthly reviews/recommendations, attend QA meetings, provide drug regimen reviews, and provide regulatory compliance assistance to minimize your risk and reduce issues during facility surveys. In-servicing Needs » Monthly in-services along with nurse and pharmacist consultant reviews and reports are available upon request. Medication Delivery » Routine, STAT, after-hours; Williams Bros. delivers the right medications to your facility 24/7. Cost Containment » Ensure quality of care and improve outcomes for long term care residents at a reduced total system cost.